We almost all now have one or more smart devices in our home from appliances to phones. These devices enable us to execute our personal lives with much more efficiency than ever before in our history while also making us smarter about how we perform tasks. My fridge reminds me when it is time to change the water filter. My smartphone tells me to leave for a meeting early based on traffic conditions. My search engine allows me to quickly identify the most hilarious funny cat video at a moment’s notice so I can share it with my friends on Facebook. The age of consumer driven instant gratification around accumulation of knowledge whether trivial or critical is equally important in our business enterprises. Having the right information at the right time gives organizations a competitive advantage in how they execute towards business objectives. However, most enterprises still seek a “Knowledge Management Tool” that will upon installation instantly solve their organizational challenges. 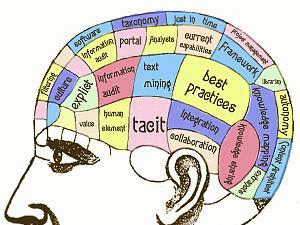 So how does your organization go about implementing knowledge management? Here are some guidelines to help. By doing the above items, your enterprise can encourage employees to start building up the data knowledge you will need to drive analytics and search. However, but empowering communities, many employees will understand instinctively where to find important information or which peers can help them by viewing who is posting frequently. Suddenly, with a few simple tools and people based processes, the enterprise external brain takes off and the improvement cycles begin.